Getting a close shave doesn’t have to be a horrendous right of passage for men with wavy, curly, or textured hair. We’ve all been there: craving a smooth shave, with razor in hand, knowing full well the end result will mean complete and utter torture from razor bumps on our sensitive faces and necks. Many of us brave souls do it anyway and walk away scarred, literally, and upset we won’t be able to partake in this manly grooming activity. 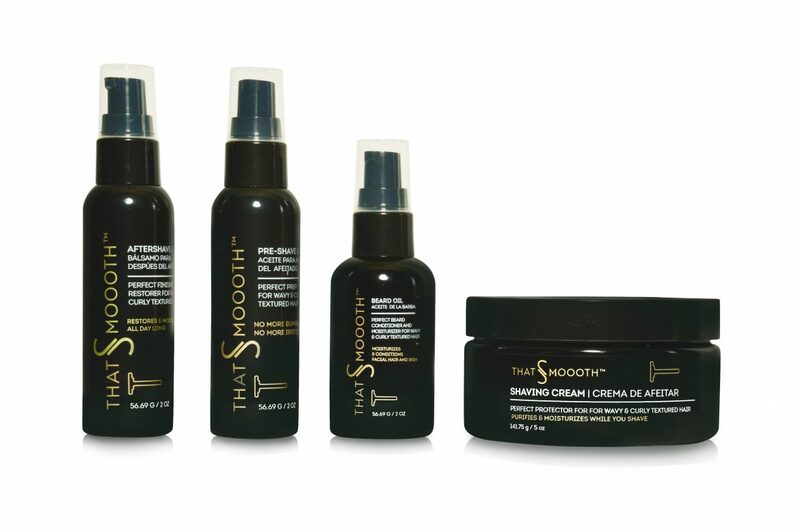 Entrepreneur Miguel A. Martinez has formulated That’s Smoooth, the ultimate multicultural line of grooming products that promises a healthy shave without razor bumps. A native New Yorker from Harlem of both Cuban and Puerto Rican descent, Martinez found himself frustrated by the market’s absence of skin-healthy shaving products and accessories that worked for people with wavy to curly hair, and men of multi-cultural descent: men of color. He took matters into his own hands and created the That’s Smoooth line of natural and organic-based products, a daily shaving system for this demographic that gets rid of razor bumps, irritation, and harmful ingredients. That’s Smoooth is a complete shaving system. It includes a specially-engineered single blade razor that shaves wavy and curly textured hair at the skin level while providing a barrier between the skin and the blade, thus eliminating irritation and preventing ingrown hairs. That’s Smoooth’s revolutionary anti-aging products repair the skin’s barrier and retain moisture twice as fast as competitive shaving products, with no harmful ingredients. Their number one selling beard oil is the perfect combination of Argan, Carrot Seed and Avocado Oils. Making textured beard hair pliable as it conditions the hair and skin, it also adds sheen and luster offering a well-groomed appearance all day long. Now men with wavy to curly textured hair can achieve a clean, razor bump and irritation-free shave that leaves skin smooth, healthy, and youthful looking. Finally, shaving becomes a rich and sensual pleasure that we can look forward to and not a jump through fire. That’s Smoooth is available in Whole Foods and is coming to Macy’s Department Stores in the winter of 2018. You can also purchase products online at www.thatssmoooth.com.